"It looks like it's possessed," says Denver resident Samantha Horoschak. "I have a huge fear of flying anyway, and to be greeted at the airport by a demon horse -- it's not a soothing experience." The eyes are light-emitting diodes, which burn red like taillights... The well-articulated body, laced with bulging black veins, pays tribute to a mighty breed that Mr. Jimenez saw as a symbol of freedom, strength and the American West. We used to have a couple of these at the University of Oklahoma. Very striking, certainly not to everyone's taste. However, if you dared to publicly air your distaste, it wasn't pretty. One man's letter of distaste to the OU paper sparked a number of responses like "You're just not sensitive to the plight of working class Latinos", etc. I sat there and thought, geez, just because you don't like the sculpture doesn't mean you're classist and racist. i think the horse is similar to the one described in the book "the montauk project" by preston nichols. This is just one of 4 colored horses believed to be scattered around the country and believed to symbolize the coming apocalypse. There is indeed a HUGE government base under the Denver airport that Jesse Ventura visited for his Conspiracy Theory show on TruTV (great show btw, check it out if you haven't..and no, I don't work for the channel or him. I wish I did though!!) the government is preparing for 2012 and not telling people what will happen. Jens, what are we looking at in the google link? Very melodramatic, esp the clouds and backlighting. Two light sources= two suns? Obviously the harbinger of the One World Gov, Book of Revelations Horse of the Apocalypse. 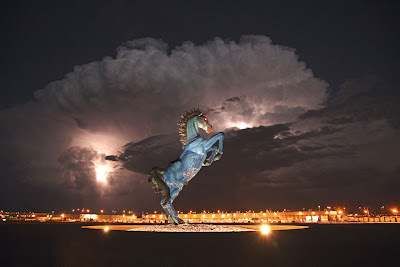 Denver is the HQ of the NWO in the West. (Jerusalem in East) Finished just in time for the NWO Pres Obama. Hideous, sinister and brimming with Evil. Quite appropos. "Yan, tan, tether, mether, pip"
"Nature, red in tooth and claw..."
Umbrellas as a "respite from social amiability"
New home sales did NOT improve last month!! Who are the world's most influential people? Making vacuum tubes - by hand! Sheep outfitted with LEDs. And cat herding.